There is a joy to camping with the SCA which comes from immersing oneself into the Medieval persona of one's own creation. 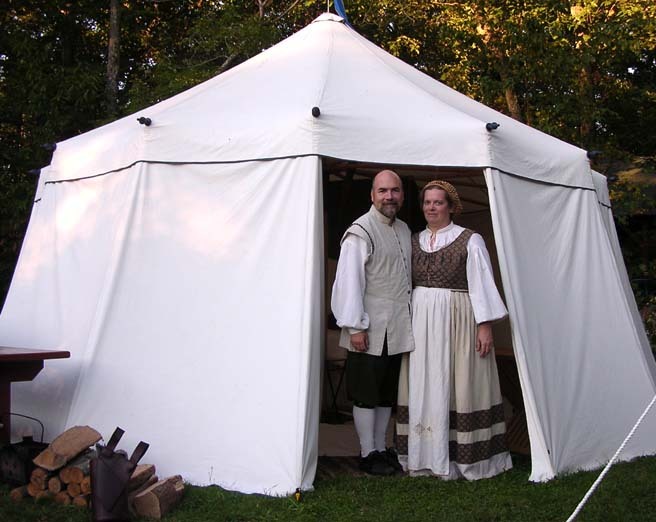 After several wondrous years with the Society for Creative Anachronism we found that our own nylon tent had become an unwelcomed reminder of the mundane world, and we were eager to graduate into something more authentic. The resulting quest led to the construction of a 20' pavilion which was as inexpensive and as simple in design as we, two frugal engineers, could hope to make it. Several excellent pamphlets and websites are already available which cover the design and construction of pavilions, and many gorgeous tents have been made by following their directions. We found however (did we mention that we're both engineers? ), that all of these designs included some very time-consuming or complex features, and some required the use of an industrial sewing machine or other special equipment. While we were about the task of "designing out" all of these features, we also planned a simple process for building and setting up our pavilion with a minimum of effort. We cut all the corners we thought were reasonable without loosing sight of our original goal of creating a convincing pavilion. Building a pavilion can be easy. Building a pavilion can be affordable. Building a pavilion doesn't require a lot of special tools. Every seam is a vertical, 1" flat-felled seam, with a grommet at each end; and every grommet is a rolled rimmed spur grommet, with a strap reinforcement. 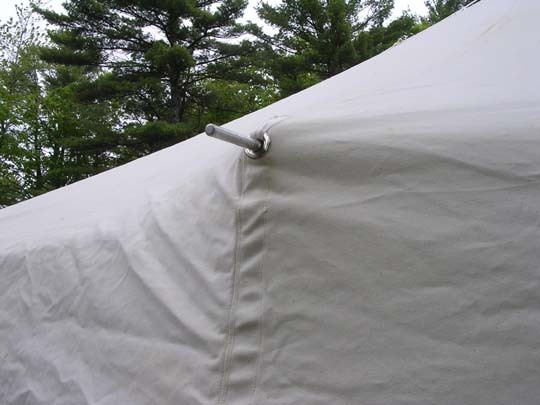 A tent can be big, strong and light if its structural stresses can be focused to where the tent is strongest: the seams. 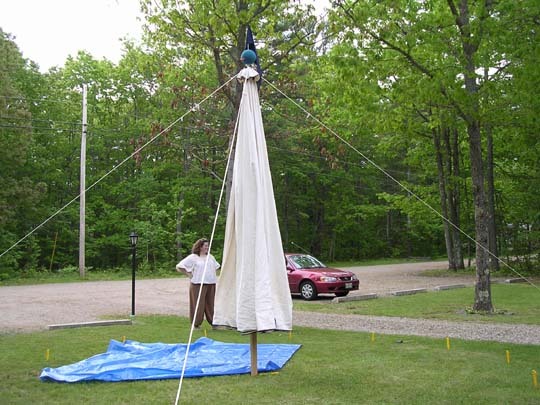 Since most of the stress in the fabric of a tent is in the form of tension running from ground to peak, we run the seams in that direction and hold all the fabric in place from the ends of the seams. 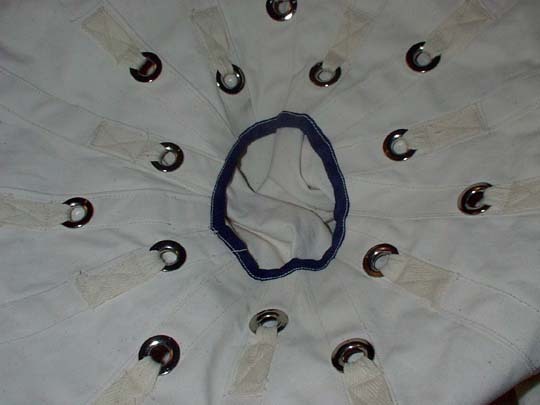 Grommets at the peak of the roof are each tied to a common welded ring, which rests atop the center post. Make the straps short enough to leave the fabric between grommets loose. This cutaway view shows the ring strapped to the roof, and sitting atop the center pole. Ever hear of a tent peak blowing out, or seen a pavilion with an elaborate peak reinforcement? That is because tension in the roof fabric can focus stress at the peak in the form of a hoop load, which can pull the roof apart between the seams. Using a steel ring to handle the hoop load leaves the remaining stress to run along the seams where the roof is strongest. A conical cuff covers the center hole and grommet holes to keep out rain, but we found that they still worked well as roof vents. They also allowed insects to escape instead of staying inside and accumulating at the peak; a definite plus! Whether spokes or poles are used, a pin extending from each goes through a wall grommet and a roof grommet to hold the roof and wall together. We are letting all of the stress run along the seams, remember? The pin transfers stress nicely from one seam grommet to the other. A more common way to secure the spoke ends is to use fabric pockets, but attaching the pockets to the inside of the roof requires sewing through a lot of fabric. The fabric pockets also don't hold the roof and wall together. Grommets at the bottom of the wall are strapped to ground stakes. 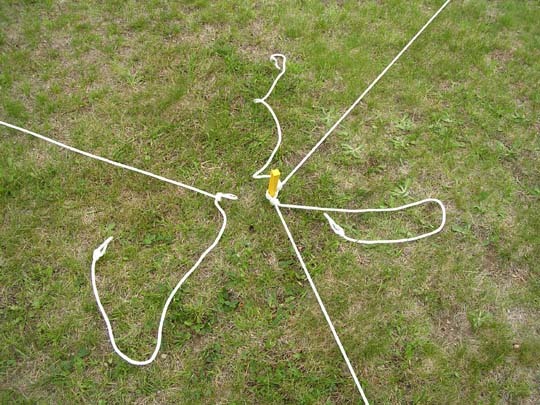 We set up the tent with the loops loose like this, then tighten them later. This makes replacing worn out stake loops easy, and it's just as strong as all the other connection points on the tent. 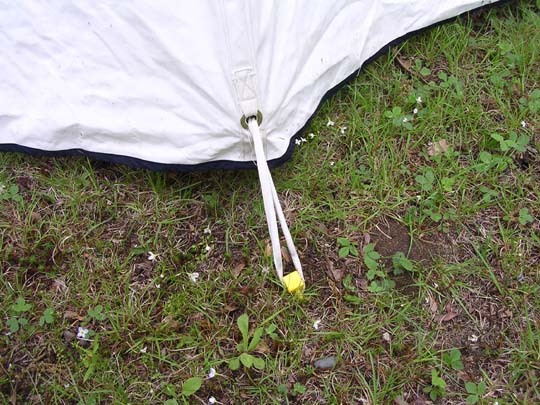 Adjustable loops also help in setting up the tent on irregular ground. Hems are not rolled, but are instead sewn with a folded, cloth tape. Rolling a hem would mean sewing through a lot of folded-over seams. That's a tough job for most sewing machines. 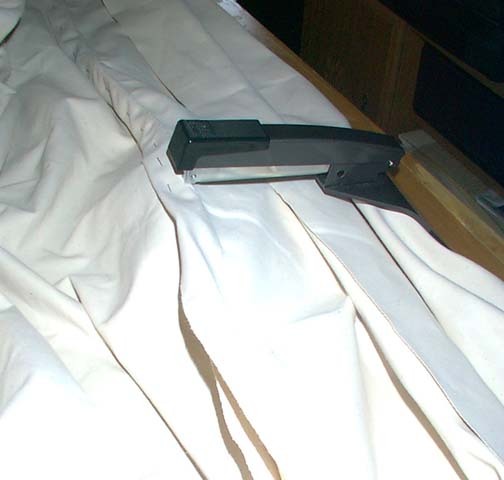 The folded tape allows raw edges to be covered over without a rolled hem. The valence is not sewn on, as it is just an extension of the roof panels. Sewing on the valence would mean having the valence seam cross the vertical seam between the roof panels, and would require sewing though a lot of fabric. Together, these features minimize sewing and maximize the strength of the pavilion. 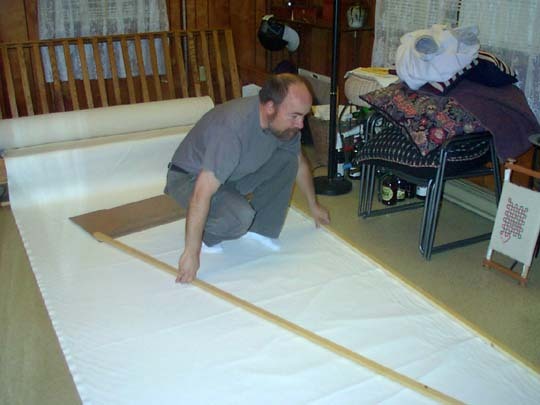 Any household sewing machine that can handle a flat-felled seam in canvas can be used, as there are no seams over seams. Stress in the pavilion is carried directly by the seams between the peak and the ground. 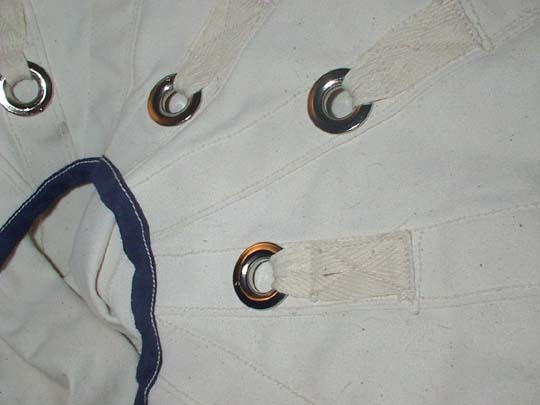 Strap-reinforced spur grommets were tested in a seam of 10oz canvas, and supported 300lbs without tearing out. Add 1.5" to both sides of the roof and wall panels for seam allowance. Cut the peak of the roof panel back until it is 4" wide. This will ensure that your seams won't overlap at the peak. Add a one foot tall rectangle to the bottom of the roof panel. This will become the valence. Add two inches to the top of the wall panel. This will allow the upper wall grommets to set at the right height. Make a full sized template for the wall panel, and one for the roof panel. Include seam allowances, valence, etc. Cut out all the roof and wall panels. You don't have to mark anywhere except along the outer edge of the templates. This roof template was put together with wood strap and craft panel. Note that one edge of the template is against the edge of the fabric, and that the selvage has not been trimmed off. Do you like how we used our futon frame as a canvas dispenser? 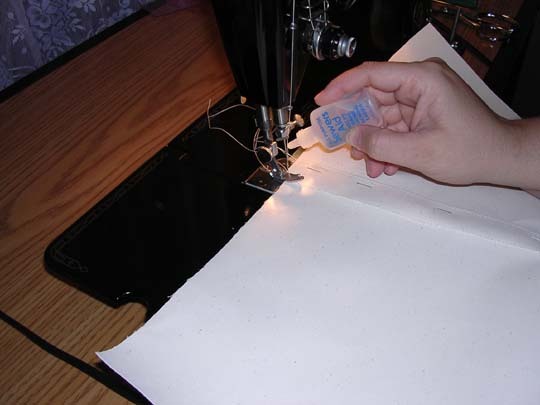 Use a common desk stapler to staple panels together for the first pass of stitches on each seam. 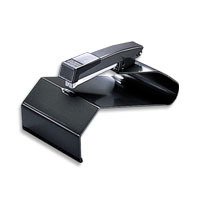 Draw guidelines on the stapler to show where the edges of each panel should align for a 1" offset. Attach the cut edge of one panel to the selvage edge of the next. Lubricate the needle of your sewing machine before each seam. 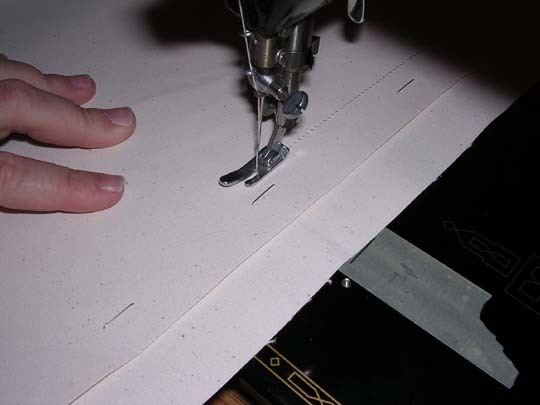 Draw a guideline on the deck of the sewing machine to keep the first pass of stitches 2" in from the farthest edge. Remove all the staples with a small pair of pliers. After rolling each seam into a flat felled seam, use a saddle stapler (ordered through Staples Office Supply for $30) to pin it in place. Secure with two more passes of stitches. These staples can be pulled out after the second pass. Trim edges with cloth tape. Do not roll hems! Install grommets, one to each end of every seam. Stagger the grommets at the peak, alternately 2" and 4" from the edge, to avoid a "tear along dotted line" pattern. Place grommets 12" from the bottom edge of the roof, 2" from the top of the wall, and 3" from the bottom of the wall. Add a strap reinforcement of cotton webbing to every grommet. We attached a 6" privacy panel of canvas on the side of the door opening, and installed grommets all along the seam. We then attached corresponding loops of cotton webbing on the edge of the door panel. The loops are just long enough to reach the next loop and grommet. Once a loop has been passed through its grommet, it can be pulled to the next grommet so that the next loop will secure it. A knot in the last loop then keeps the line of stitched loops from falling open. It works the same whether the door is being secured from top or bottom, from inside the tent or out. 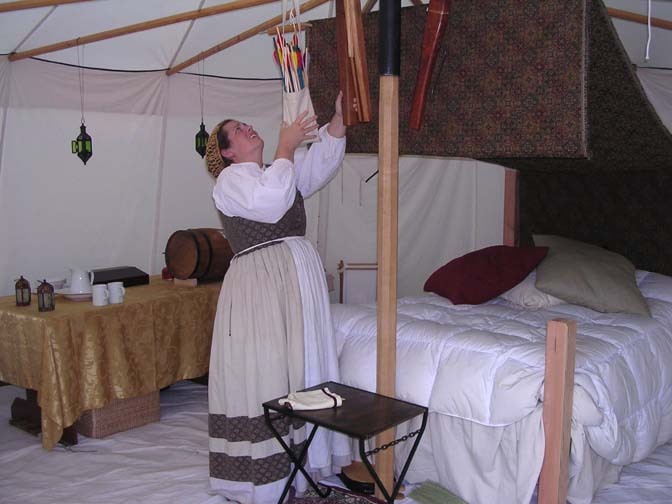 I have never seen evidence which suggests that this method was used in a Medieval European tent, nor found a better way to hold a tent door closed. 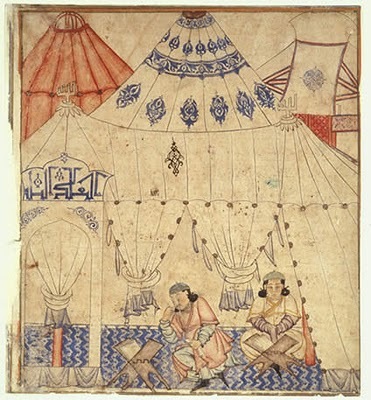 Mughal era painting showing the loops & grommets used for fastening tent openings. Diez album leaf probably from the Jami al Tavarikh of Rashid al-din. Ilkhanid, Tabriz, ca.1307. Staatsbibliothek zu Berlin. "Felt Tents & Pavillions," Peter Alford Andrews. With thanks to Mary Ostler for posting this image! Loops are on the door's edge. We added a narrow privacy panel to the end of the wall, and mounted the grommets onto the resulting seam. Beyond supporting the peak of the roof with the obvious center post, I have found three good ways to then support the walls of a pavilion: ropes, poles, and spokes. An extensive web of ropes can be used to hold the lower edge of the roof away from the center post, with the walls then hung from the roof. Although this was certainly the most common method in use during the Medieval period, it is not practical at most SCA events. There is faint argument that vertical poles or horizontal spokes may also have been used in period, but both work well to make the best use of limited camp space. Our pavilion can use either spokes or poles without changing anything else. It should also work well with ropes, but the neighbors certainly wouldn't like it. I didn't invent much of anything here, and so will not belabor the construction of the framework. If you use poles or spokes to support the walls, they will each need a 5/16" diameter metal pin sticking out of one end by about 4". Chamfer the top of the center pole so that the peak ring will center on it. This is how we built our center pole. It is 3" in diameter, and has a joint in the middle with an 1.5' length of pipe for a sleeve. The 1" pad on the bottom is a separate item. One of the earliest accounts of the hub and spoke design describes how the basic form of the hub was made by gluing together a stack of plywood disks. This was very likely done either for lack of better materials, lack of appropriate tools, or both. The hub so constructed promptly split apart during use, and was then put back together with a generous quantity of screws. It was plywood after all, and the wind-driven motion of the spokes quickly leveraged the veneer apart. With that cautionary tale in mind, the hub of the Taj Pavilion was constructed of solid ash. Several methods of isolating the wind-driven motion of the spokes were considered, but the simplest ideas are often the best. Steeply taper the ends of each spoke so that it loosely fits the socket only at the opening, and it will then be free to move several degrees before it can even start to pry against the hub. Before doing this, our hub would entertain us during windy weather with the most unsettling groans. It now quietly rides out every storm. The hub of the Taj Pavilion rests on top of the sleeve. Sockets were cut into the hub in a staggered pattern to prevent them from running together. 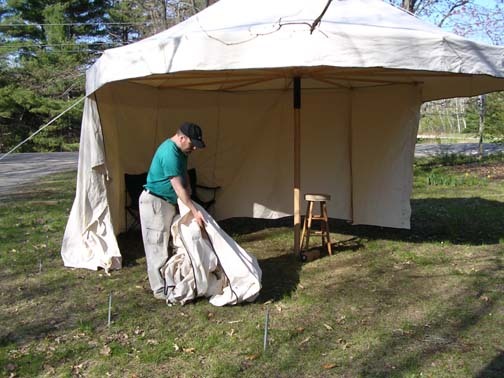 Our tent has no sod cloth to seal along the ground, and our canvas floor is kept dry by virtue of having no contact with the walls. 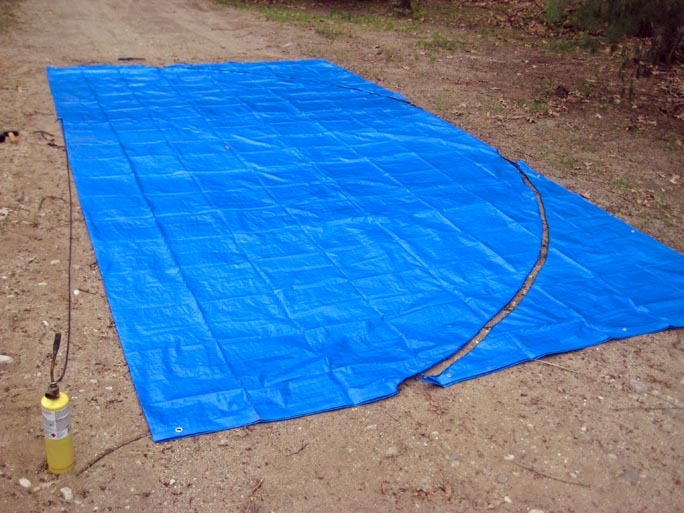 We also use plastic floor liners to help keep the floor clean, and this has also kept the floor away from what little rain water has ever gotten in from under the wall during our worst weather. A well pitched tent hugs the ground, and that has served to keep stray dogs and squirrels from entering under the wall. We live in New England, and so know nothing about having to keep pests from crawling into the tent at night. This is how we cut round floor liners. to guide a propane torch along a radius. This is what it took to build the 20' diameter Taj Pavilion. Note that we bought more than we needed of everything; sometimes out of prudence, and sometimes because we couldn't buy exactly what what we were going to use. Some prices are approximate. Specific sources are listed only for single-source or hard-to-find items. The canvas was boat shrunk, flame retardant, water resistant, and mildew resistant; well worth the price. Some prices are approximate. Shipping costs are not shown. 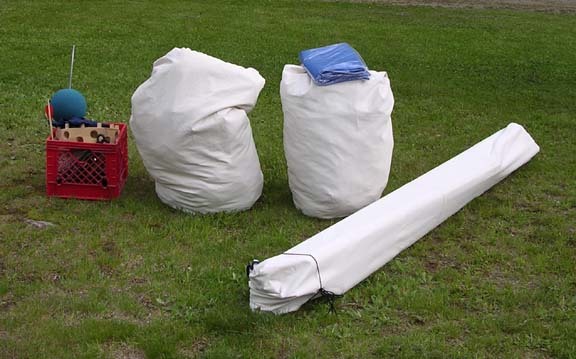 (Used about 67 yards) Itex, Inc. The Taj Pavilion has a spoked framework, but most of these directions will also apply to a pavilion with poles or ropes. 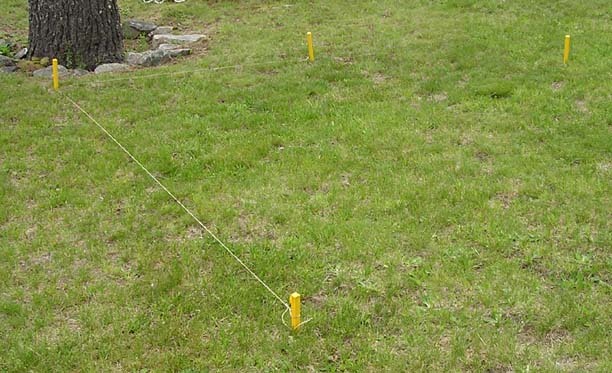 Distances between loops are determined by the radius of the floor, and the distance between stakes. Did you forget anything up there? Could I have put the hub higher?!? Got wind? Attach walls to stakes first, and keep loads on the roof balanced. Attach walls to stakes, and drive the stakes. Mickel picks from the "crossbow tree"
Dragonwing, the website of John LaTorre, a California tent maker, with articles on how to design and make pavilions. Circa 1265, the website of Andy Goddard. House Greydragon, the website of Peter Barclay and family. 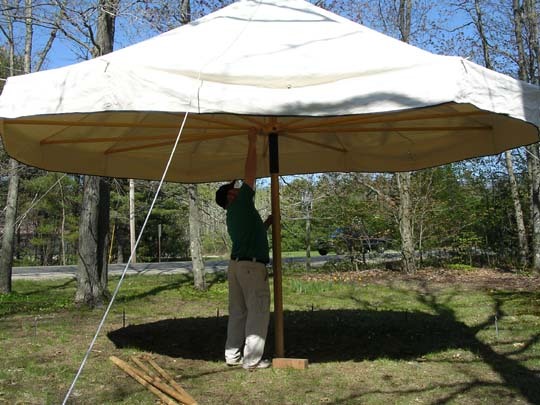 Making a Medieval Single-Pole Pavilion, an article by David Kuijt, ska Dafydd ap Gwystl, webbed by Stephen Bloch, ska mar-Joshua ibn-Eleazar ha-Shalib. The Kingdom of Atlantia, Arts and Sciences, look under "Arts and Science" for their "Pavilions and Tentmaking" links. Medieval Pavilion Resources, website of Baroness Mira Silverlock. Woodbutchery and Other Stuff, the website of Mary Ostler. Visit our SCA Personae page for photographs of recent events! This page was created July 28, 2001. Last changed April 21, 2011. Photographs and other content are copyright 2008 by John Wilson unless otherwise credited. This web site was created and is maintained by John and Lee Wilson. Removeth not the back panel; there are no user serviceable bits therein.